We seldom seem to be able to get out of Southeast Arizona before the saguaro bloom. Afternoon temps are passing 90; can 100 be far behind? The tops of the saguaro are crowded with dozens of buds, a month’s worth of blooming, white trumpets beckoning to doves, bats and bees. The green ribbed stems and arms, reach ten metres or more against the blue desert sky crowned with a ring of fat green buds and white blossoms. By mid April the prickly pear buds swell, turn a soft peach, open and slowly turn lemon yellow. The mix of colors on the green (or purple) thorny pads is a joy. 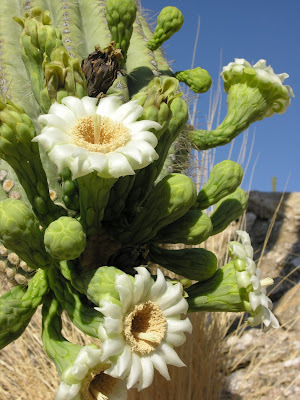 By now, early May, the cholla begin to bloom; my favorite combo is one with burgundy arms and bright bronze blossoms Our bicycle rides already begin early, to beat the heat and the afternoon spring winds. I’m always amazed when people seem to think that the Southwest deserts don’t have seasons. I don’t think we have been anywhere in the world that doesn’t have distinct seasons. It’s just that you have to spend a couple of years in a place to fully perceive and appreciate the seasons on offer. We bicycled past snowy patches on our weekly Mount Lemmon ride in late April, at between 7,000 and 8,000 feet about 20 miles from Tucson; we descended into high 80’s on our way home: vertical seasons are always available where there are mountains.